To all the CBSE Class 10 students doubtnut.com wishes heartiest congratulation on successfully triumphing over the first big milestone - The Maths board examination. Hopefully your exam went well and if you are worried about aptness of your answers that you have written, then Doubtnut.com presents to you fastest and most accurate solutions of your CBSE Maths Question Paper 2019. The solutions are created by our examination experts, as you already know! It is our endeavor to help you evaluate how well you performed in the examination. The CBSE board exams are prepared keeping in mind every kind of student i.e. below average, average, above-average and intelligent students. Hence, the approx. 70% of the question paper will going to be quiet average and only 30% will be a bit hard. For this year’s examination total time allowed was 3 Hours and maximum marks 80. The CBSE question paper Math 2019 consists of 30 questions divided into four sections A, B, C and D.
The internal choice has been provided in 3 marks question and 4 marks each. Students only need to attempt only one of the alternatives while solving these questions. Important NOTE: Students please stay tuned with doubtnut.com for the last-minute study material, sample papers and tips and tricks to score 90+ in other subjects as well. A lot more is coming your way every day in the blog section. Also, if you are thinking how to study for final exams, then, check out expert tips and tricks to score 90+ in tenth board mathematics examinations. 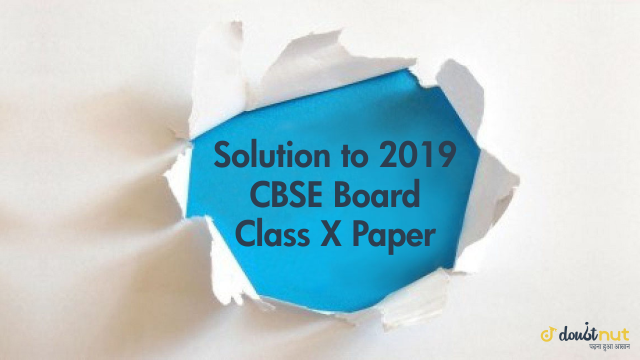 Have you been solving the CBSE sample papers or not? If not, then please get started with it. Time and again we emphasize on the importance of the CBSE sample papers. Sample Papers are VERY important if you wish to score the 90+ or rather we wish you full-on-full marks. CBSE Sample papers are a must to do item before going for final examinations. They will help to evaluate your preparedness level. These are prepared in reference to previous year question papers trends and latest paper pattern. All the CBSE Class 10 Maths Sample Paper comes with answers. Here at Doubtnut.com, you can easily find 10th board samples papers for all the subjects. Download now! At doubtnut.com, we strive to facilitate the easy and rightful access to quality educational materials for all CBSE students across every nook and corner of India. Refer to DOUBTNUT App – India’s leading e-learning destination for CBSE students of all age groups. With the highest 4.4 play store rating, DOUBTNUT App is the student’s favorite destination to prepare for tenth board examination. With Doubtnut App you can easily download last 10 years question papers, sample papers, NCERT solutions and much more. Keep visiting doubtnut.com for interactive study material.